Thus results are one of the most important part of any simulation. One can’t simply accomplish his/her simulation mission without properly post-processing the results. 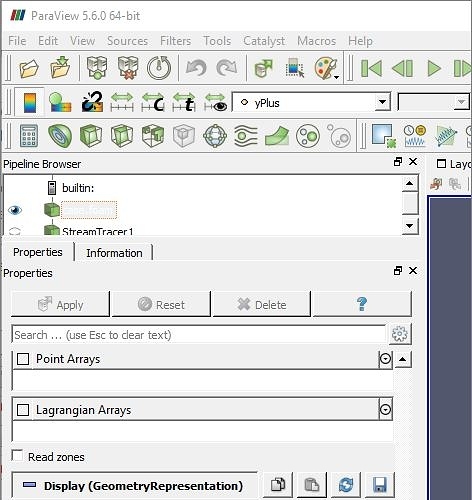 Therefore, this post shows how to post-process the solid mechanics simulation results using both the online post-processor and local ParaView. So let’s get in to it! Before we start, let’s have a look at the similarities between both post-processors. 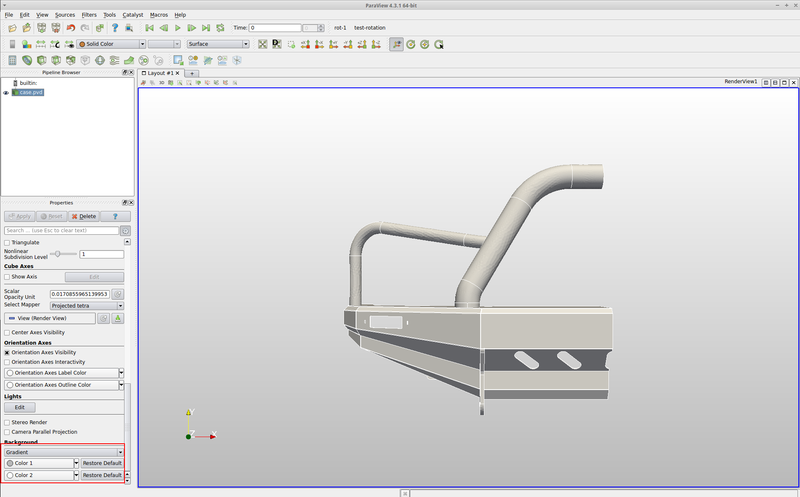 Since the online post-processor uses ParaView in the background, therefore there are many similarities between the two. The figure below shows these similarities with description. Orange: You can change how your model under viewer should look like e.g. surfaces, surfaces with edges etc. 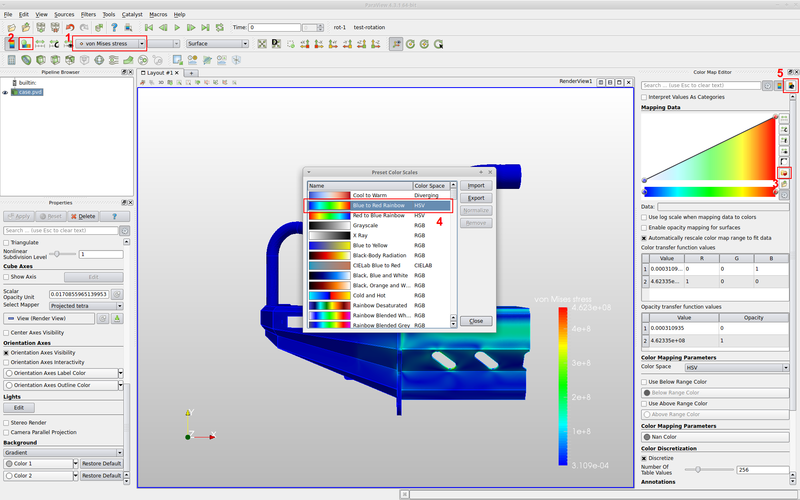 Yellow: You can select a specific timestep frame of your simulation. This option will only have multiple steps in case of static nonlinear or dynamic analysis. Light green: You can rescale the color bar to your need. For example, you can rescale your vonMises stress from 0 to 1e7. 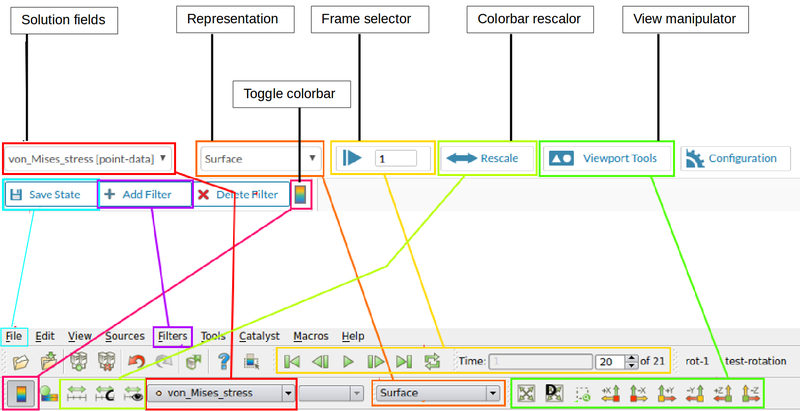 Green: You can use these tools to change the view of your model in viewer. Blue: You can save the state of your post-processor so that you don’t have to reapply all the settings when reopen the post processor next time. For local ParaView, you can save the state by going to File and then clicking Save state. to reload the state in ParaView next time, just go to File and then click Load state and select the saved state to load it. Purple: You can add different filters based on your requirement. In local ParaView, under Filters you can either look for the filters arranged according to their type or directly search for one by using Search option. Pink: You can toggle on or off the color bar (legend) which shows the value range of your selected solution field. If you want to have post-process results quickly, use online post-processor. On the other hand, if you want to post-process the results and apply some special filters to get much better looking results, use local ParaView. In some cases if your mesh is big and you have low memory available on your PC, using online post-processor is recommended. Loading results in local ParaView is not as simple as in online post-processor that you click the Solution field of the results and it automatically loads it in viewer. For structural mechanics simulation, the file with either name case.pvd or sim_0.vtm needs to be loaded. Before doing these changes, make sure that you have opened the result file in local ParaView and have clicked the Apply button. Otherwise you would not be able to follow the steps provided below. Background: The background of the local ParaView is always different than the online one. To make it similar, scroll down to the end in the properties panel and change the Background from Single color to Gradient. Click Color 1 and change Red, Green and Blue to 185. Click Color 2 and change Red, Green and Blue to 255. Make sure you have selected a desired solution field whose color map (bar) preset needs to be changed. Click Edit color map button which will open an edit panel on the right. Click Choose preset button to open a new popup window. Choose the second preset i.e. Blue to Red Rainbow. In order to change the text color of the legend, click Edit color legend properties button. You have to change the preset color for all other required solution fields by following the same procedure. Now you have learned the basics and also how to setup the local ParaView for post-processing, let’s jump in to our first example. The post-processing is performed in parallel with local ParaView on the left and online post-processor on the right. Step-1: Load the results in both post-processors. Step-2: Due to symmetry, only half of the model was taken for analysis. In order to make it full, we have to reflect (mirror) the model along symmetry plane. This can be done by using Reflect filter. In order to turn off the visibility of center of rotation lines in online post-processor, click under Viewport Tools. Furthermore, to enlarge the viewer you can close the side tree panel by sliding the panel bar to the left. Step-6: Apply the desired solution field to this filter e.g. von Mises stress in this case. Make sure the color bar is turned on. If your values of legend in local ParaView is not same as online one, click rescale button highlighted in blue. Step-7: In order to enhance the geometry deformation, increase the Scale factor to 100 and then click apply. You will see that now the deformed state is scaled 100 times. Step-8: Next we can rescale the legend values to our need. For local Paraview, click Rescale to custom data range button to rescale it. On online post-processor use rescale to do so. The rescaled stresses are shown in the background. Step-9: In order to save the screenshot, click save screenshot button under Viewport Tools for online post-processor and File > Save Screenshot for local ParaView. The saved screenshot will appear under Screenshots in left tree. As a second example for post-processing multiple step nonlinear static or dynamic simulation, please follow the tutorial here. 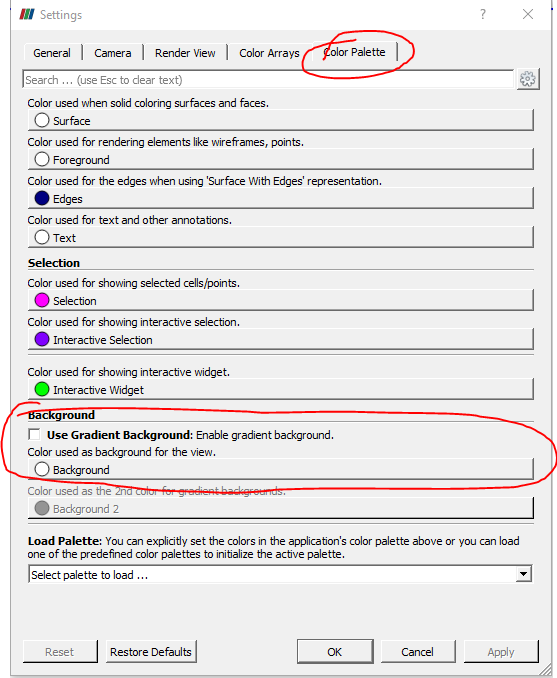 I am unable to change my background colors as per above instructions. Has anyone found how to set background colors on v5.6.0? Google is no help and there is no result in ParaView settings for ‘background’. You can do so via “Color” slightly further down. Refer to the screenshot. Do make sure you’re not selecting anything in the data tree. Very peculiar. May I know if this the MPI version of ParaView or the exe/zip version? So the MPI version then. I suggest not using the MPI version to fix this issue. On top of not being familiar with the MPI version, that version is not intended for use in personal computers as far as I know. MPI should mean Message Passing Interface and is usually used for a remote or removed PC’s communication with another computing device, usually a HPC. Obviously with applications related to HPC data processing, the software is usually barebones in order to allow for customization on the user end. So better to use something that is more tailor made for personal users (non MPI ParaView) and have all the features that the ParaView developers think should be easily accessible and already implemented to ParaView as a post-processor. 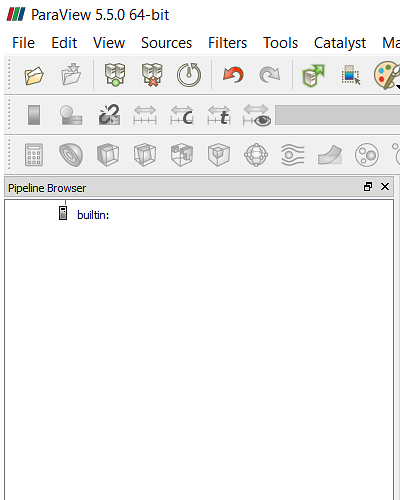 The non MPI version of ParaView does not even have MPI at all. MPI is, as mentioned, just a communication interface. The issue is more that the MPI version of ParaView is, also as mentioned, barebones to allow for heavy customization on the HPC user side. Darn!!! No change with non-MPI version. I found work around. See if this works for you. Under Background you can change the color as you wish.